The last LA session of the $60,000 Ribbon Microphone Shootout was recorded by Randy at the Disney Character Voices studio in Burbank, CA. 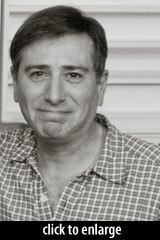 We were blessed to have character voice master Corey Burton on hand for this test. Corey cooked up four different voices to exercise each mic — and then delivered them, one after another, damn near identically 16 times in a row. Corey sat in the main voice booth at the DCV studio. As you’d expect, the room is well-treated, as it was built for the specific purpose of recording voices. We recorded two mics at a time. They were painstakingly positioned side-by-side. The working distance was at Corey’s discretion. We hear twice as many mics in the same amount of time, reducing artist fatigue. 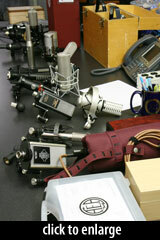 We can compare some mics on identical performances — a fact we took advantage of by hanging interesting pairs, e.g. : Samar #5 vs #6, Cloud JRS-34 vs. AEA R44CX, Cascade Fathead vs VinJet, Royer R122 vs. R122V, AEA KU4 vs. RCA KU3A/10001, etc. All mics were recorded dry, through a pair of Martech MSS-10 preamps, into Apogee PSX-100 converters (at 24-bit, 48 kHz), clocked by an Apogee Big Ben master clock, directly into Pro Tools. Randy, Ryan Canestro, and I triple-teamed the mic changes. Randy engineered. Brienne Michelle took beautiful photos, some of which you can see on this page. Corey was in charge of Vocal Awesomeness. The line Corey performed is an excerpt from the introduction to a CBS radio show called Escape, dating to the 1940s. That was to see how dense the sound of that placement and pitch is. It should sound really inky and heavy, on a good ribbon, without hearing a lot of transient texture. On a condenser, that placement [the William Conrad voice] can sound strangulated. But it should sound big and warm and heavy and imposing… Arresting. Usually it was William Conrad, or Paul Frees, very close to the microphone, seducing the listener into this mysterious world, setting the stage. The pirate [voice] is for texture, to see if it gets that magical, rich, complex texture instead of sounding splattery. It’s the Pirates of the Carribean texture. 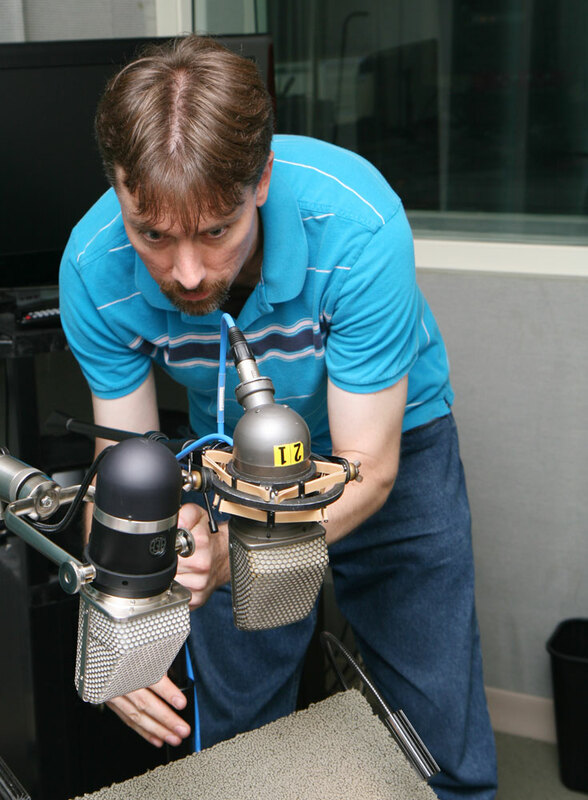 When pirate voices like that are recorded with a condenser, they tend to sound spitty and shallow. A ribbon will usually fill it out, and give it a roaring energy. It can sound tight and “fake-y” on anything but a great big classic ribbon. It’s a very coarse texture. A ribbon mic makes it sound magical, instead of just … ugly. 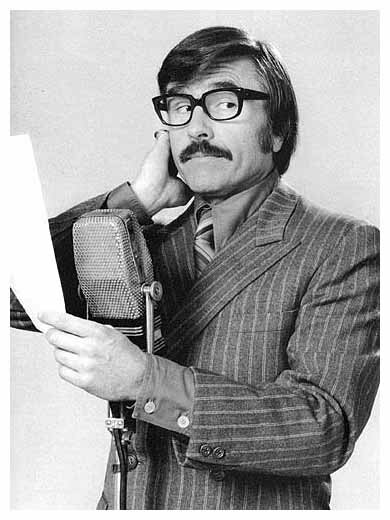 Gary Owens has that plummy, full-rounded announcer voice. I always think of Gary Owens and the RCA 44 because of Rowan and Martin’s Laugh In. It always sounded so full, springy, bouncy. [I chose this voice] to get that round, old-fashioned announcer chest tone. And again, only a ribbon microphone gets a magical springiness to that chest tone, as opposed to the drier, more percussive chest tone that a condenser or dynamic would tend to impart. With a mismatched microphone, that sort of placement [the Gary Owens voice] would sound hollow, instead of very chest-y and rich. In the original War of the Worlds broadcast, that could have even been an early dynamic microphone. Orson Welles used a dynamic microphone a lot. But then his voice was a little heavy for a ribbon… an early [RCA] 44 or 77A would have been a little too thick, I would think. They’re all old-timey voices, because that’s what I associate with classic ribbons. What I want to hear in a modern ribbon is something that lends a similar type of magical quality, but cleaner, so that it passes inspection with modern ears. Those nasal-toned announcers, with the little swoops of delivery — that sort of swooping soaring thing, it’s sort of like a frequency-response evenness test, to my ear, because those swoops should be even [in] volume. Instead of surging, it should all sound … like it’s compressed. Randy gain-matched the Mercury Theater clip, then output full-resolution WAVs, which I converted to 320kbps MP3s via lame. That’s what you’ll hear below. To hear the other three voices Corey performed — the William Conrad line, the pirate soap commercial, and the Gary Owens line — and to hear the head-to-head comparisons of each mic pair we recorded, grab the full session here. Randy and Corey chatted about the session. 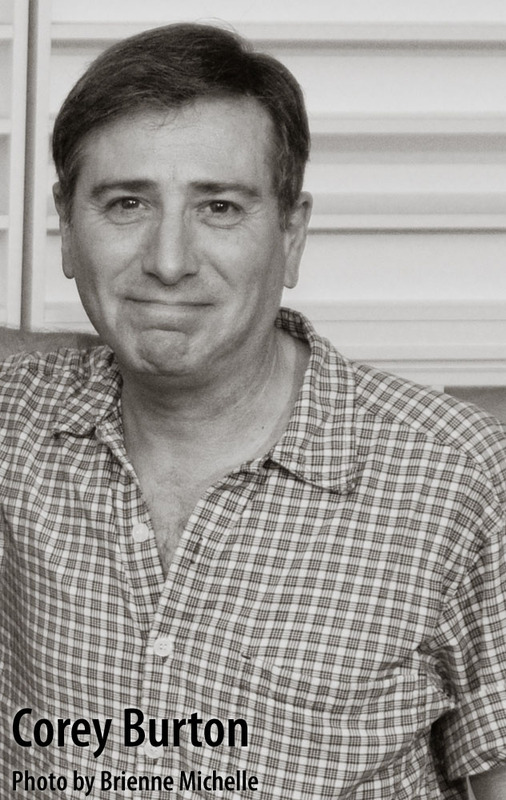 We’ve transcribed part of the interview here, and we’ll post the original audio soon — it’s well worth listening to, just to hear Corey demonstrate the voices he’s describing. RC: Of all the mics, what were the ones that stand out? 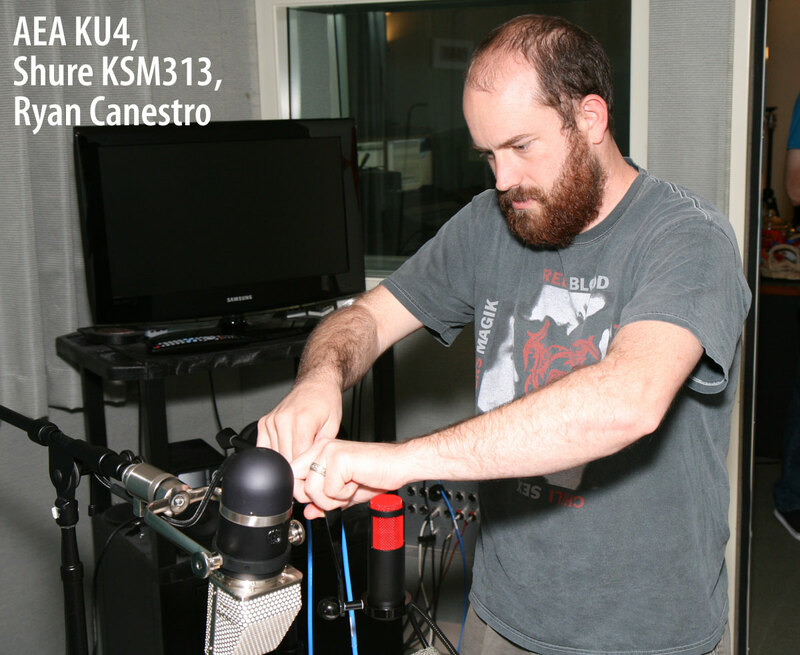 CB: I was most interested in the [AEA] KU4, which did not disappoint. But then again it was not quite as flavorful as its predecessor, the [RCA] KU-3A. It was great, but not something I would use without EQ, without enhancement, to do something meant to sound old-timey. It had all the right qualities, but sounded modern. Probably the standout was the one I cannot remember the name of, the ones with the ultra-powerful magnets? CB: Yeah, that one. Those both were outstanding. RC: What differentiated the Royers from each other? CB: The [R-122V] tube had a little more character. The solid-state [R-122] was flatter, more clean, more natural. Both excellent. Not particularly colorful, but really good. A little EQ, and either one of them could be used in so many ways. I did prefer the tube for voice. It just had a little more ribbon-y flavor, more of a character thumbprint to it. The Royers are modern and clean sounding for ribbons, but excellent. RC: I also remember you enjoying their low-cost ribbon [the Royer Labs R-101]. CB: I love that. Because that did have — it wasn’t like an RCA flavor. In fact it wasn’t exactly like any old ribbon that I’ve heard. I guess [it was] closest to a Reslo as far as overall character and flavor. Not in response curve. RC: How would you characterize a Reslo? CB: It’s zippy. It’s got a nice, metallic — in a good way, metallic — resonance to it. Exciting. It’s sort of like an aural exciter. [The R-101] kind of did that all by itself, adding an exciting enhancement to voices. It didn’t sound unnatural, but more of a condenser-y kind of sheen on the top end, and nice and flavorful on the low end. Not muddy in any way, not tubby. But big and tasty. To me, it came close to what a 10001/KU-3A does to voices. Just gave it some sparkle that is a part of the character of the vocal tone. It didn’t sound artificial, yet definitely something bigger than life. 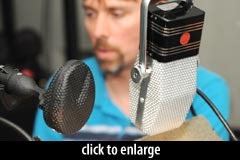 [It’s] not quite transparent reality, but that’s not what I want a ribbon microphone for. I want bigger than life. Shifting placement and pitch, it’s all enhanced in an equally flattering, listenable way. 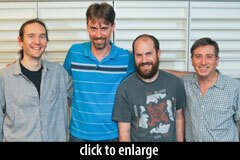 A very handsome sound to the entire range of voices — I didn’t hear any weak spots in it. Whereas the original Royer, the 121: warm, but no snap at all. No immediacy, no presence. Just rich. But the 101’s got real flavor to it. I loved it. I first compared the RCA KU-3A to everything else, because I wanted to understand its appeal. It is a lot brighter than many of these other ribbons, even the ones that in previous sessions demonstrated an extended top end. But it’s not just a high-frequency boost that’s happening here; there’s an undeniably cool sheen to the voice that I don’t hear on any of the other mics. It has presence. 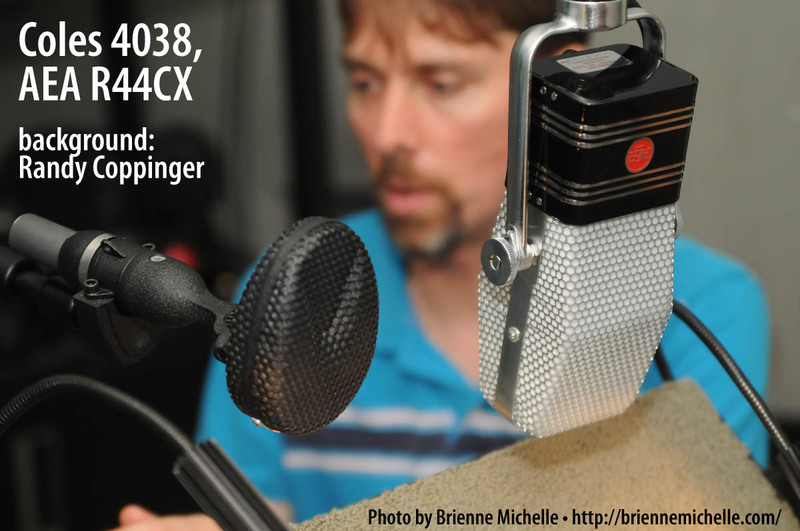 It sounds closer, crisper, more detailed, and more engaging than the other mics. The mic is bright, but I think the midrange is where the magic happens. AEA’s supercardioid KU4 comes very close to this sound. The KU4 and KU-3A MP3 clips above are from different performances, but the session file contains a head-to-head test (from a single performance) that will let you compare them directly. I can hear what Corey likes about the Royer Labs R-101. It’s not as glossy or open on top as the old RCA mic, and it sounds heavier in the low mids, but it has an appealing character — impressive for a relatively inexpensive microphone. The little beyerdynamic M 130 surprised me here. I expected an unusably bass-heavy track, but in this application the mic sounds pretty slick. It’s scooped in the mids, which isn’t ideal for a voice application, but it’s a neat sound that might be just right for some applications. The two Samar Audio Design MF65s sound great here. They’re balanced and rich, with an appealing texture in the mids and just enough low-frequency warmth. I prefer serial number 6 on the deep William Conrad voice; on the voices with more tonal range, I found both Samar mics equally nice. The are a number of good sounds in this session; so long as you’re not trying to match the sound of Disney cartoon from 60 years ago, many of these mics would be suitable. In a subsequent, informal test on my own voice, I really liked several of the mics: Shure KSM353, Shure KSM313 (rear side), AEA R84 (rear side), Royer R-121 (rear side), Royer R-101 (rear side), Audio-Technica AT4080, Samar MF65 s/n 6, and sE VR1. As is always the case, which of these sounds is best for your needs depends entirely on the source and the context. A close listen to the full Corey Burton session should make the sonic differences between these mics, and their relative strengths, very clear. And if there’s interest, I can post my own narration samples for further dissection and discussion. Huge thanks to Corey Burton, whose interest, patience, and expertise made this test far more fun and educational than it would have otherwise been. “Venti” thanks (mandatory coffee humor) to Randy Coppinger for organizing and recording this session, plus the followup interview. Ok, that was way too fun! I’m listening through my good quality etymotic earbuds right now through a generic laptop sound card. I need to go through this shootout again in my studio. But here are my thoughts after listening in this setting! Great performance by Corey, so consistent and a phenomenal voice actor! I think my absolute favorite mic’s were the Shinybox 46U, Shure KSM313 (backside), RCA KU-3A, and the Royer Labs R-122V. I think if I had to pick one right now, based on the shootout, I’d go with the Shure KSM313. It had such a great blend of a vintage and modern sound. I’m shocked at how cheap the Shinybox is too! THANK YOU for this shoot out. As Corey knows I love Ribbons just as music as he does, and there is no finer and more knowledgeable person to have at this shootout than CB. The only thing I regret is that he did not tell me about it, so that I could pester him to let me come along. All the Royer mics are excellent sounding –the R122V sounds a little more evenly balanced than the R122 which leaned to darker end. All three of the Royers sound fantastic and with a little eq can be very versatile. I’m a little surprised by the Shure KSM 313 Or maybe I shouldn’t be. Shure did make one really great ribbon mic, the SM3B, of which the 313 seems to have some similar qualities. But all in all the darling of the bunch is the RCA KU-3A. It is so well balanced. As was pointed out, the midrange is where it all happens, and for VOX that where it needs to happen. And to think, all of the KU-3A were all hand made by one man just a few blocks aways from where this shoot out took place. Thank you all again for this wonderful shootout. Sorry I’m late to the party, but I’ve been busy and I wanted to give this shootout the full attention it deserves. We’ve moved into a different realm that goes beyond comparing VO mics to the U87. Listening to Corey Burton select mics is like watching a graphic artist choose just the right brush tip and then blending just the right color. We are taking the extra 10 minutes to oh-so-carefully mount a limited appeal microphone in a room that can actually accommodate bi-directional mics at a working distance. Nobody is a loser in this test. All of these mics are worthy; it’s just a matter of an artist selecting the right color for the moment. So, what can say? Well, apparently I’m not a total novice at this, because the Coles mics immediately jumped out to me. The 4038 has a nice balance of highs and lows. And the Coles 4050 Grabbed my ear with a mid-range character that stood up, but somehow managed not to be honky. The Royers also made an impression, with the R122 sounding natural with a nice touch of proximity. The 101 has a clean natural sound, and given the price is definitely worthy. But the real stand out was the 122-V; a horse of different color with an intimate sound that might work well with some audio book sessions. The Sontronics Sigma called out to me with a rich sound as well. A number of mics got tagged by me as sounding “authentic,” that is they reminded me of the golden age of network radio sound. Those were the R122, the KU-4, the Karma K6, the R101, and the Samars got tagged as sounding “very authentic,” meaning if you add some vinyl crackle you might fool someone into believing they’re hearing a transcription from the golden age. Since that was exactly what Burton was striving for in this session, the effect was quite convincing. So, want to hear my initial reaction to the RCA KU-3A? No kidding… I wrote “Hey, who put a condenser in here?” And I mean that in a good way. A full body with a detailed high end unlike any of the others. It’s no wonder the KU-3A is a highly sought-after favorite. I have heard that Wes Dooley might be working on a recreation of the KU-3A. If it’s true, and he gets it right, it may be well worth the wait. The KU4 is AEA’s recreation of the KU-3A! 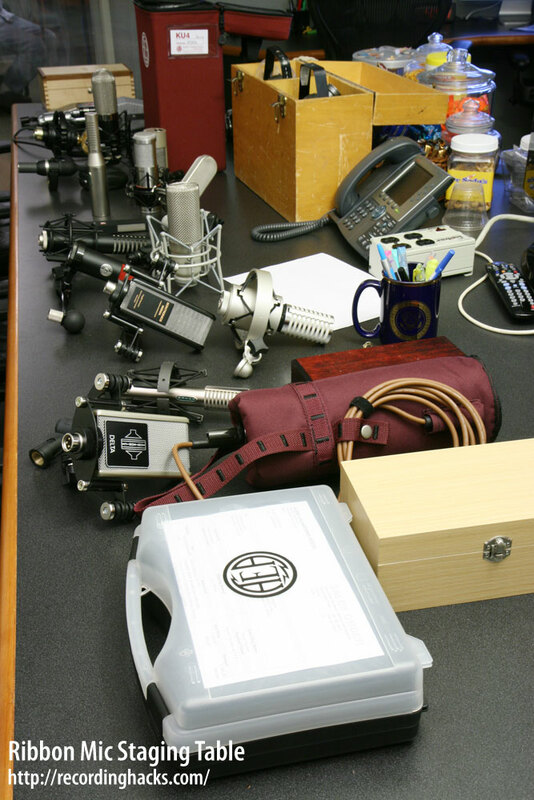 I liked the Shure KSM313, Royer Labs R-122, and Audio-Technica AT4080. 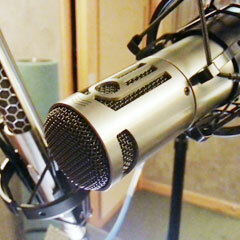 I was amazed how bright the cascade vin jet was, usually the cheaper ribbbon mics tend to be darker . The samar sounded great but its 4 grand so one would hope it would. What is the appeal of the KU4 microphone? It’s tonality definitely sounds similar to a 1940’s radio broadcast but that tone is lacking the body and the smoothness you would expect from a ribbon. The KU4 sounds like a dynamic mic with an extreme high pass filter.That’s my 2cents just wanted to comment to see what other people’s thoughts were. 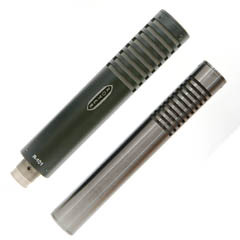 Also, due to the wide availabilty of the mxl R 144 at guitar centers and other large retailers could you include it in your ribbon mic tests soon? I’d love to hear it compared these mics. Thanks for this great ribbon microphone shootout. I really enjoyed comparing the different sounds. 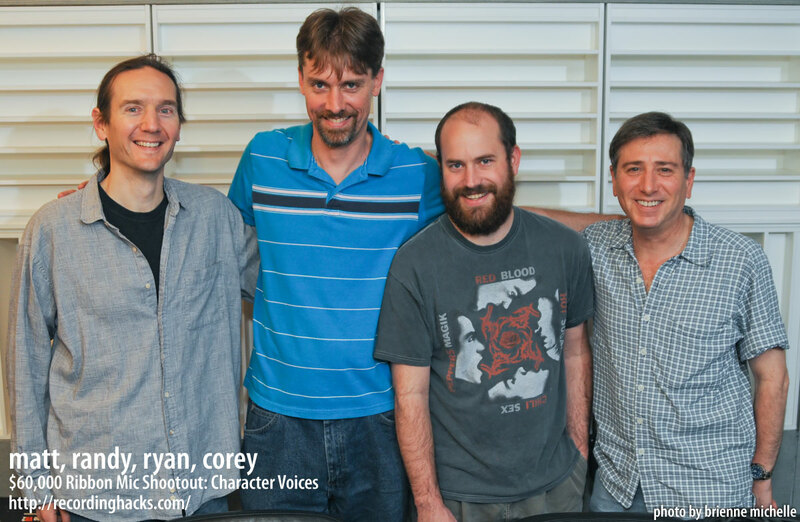 Corey is a real voice artist. Great. The M160 and the M130 are intended to be used as a MS-pair. They complement each other. The M160 (hypercardioid) is brighter, the M130 (figure 8) is darker and has a stronger proximity effect. I tried them for oice-over and added the signals of both microphones. By mixing the M130 differently, the bass portion can be increased or reduced. The M130 I would not use alone for Voice over, rather the M160. 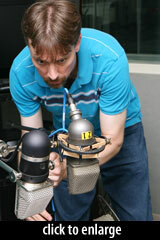 But the result is best when both microphones are mixed.